Protest at the IB monument in Madrid, June 15, 2013. Photo AABI. 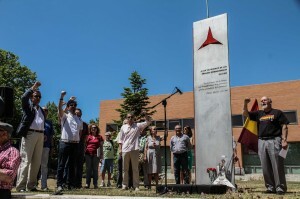 Around 200 people gathered on Saturday at the monument to the International Brigades on the campus of the Complutense University to protest the removal of the monument ordered by Madrid’s highest court. Among the speakers was University President José Carrillo, who said his office still has not received the court’s decision, and who vowed to fight the removal. Carrillo said that the although the University did officially request permission from the local government to place the monument, the government never responded to those requests–a silence that is habitually interpreted as an approval. For more details, read the blog of the Asociación de los Amigos de las Brigadas Internacionales. To sign the petition protesting the IB Memorial’s removal, click here. To read previous Volunteer coverage of the IB Memorial, click here. For a video, see below.